Centurion Systems is your turnkey partner for all your industrial and commercial access control requirements, manufacturing as well as supplying an extensive range of advanced and powerfully robust solutions for use on high-volume sites. 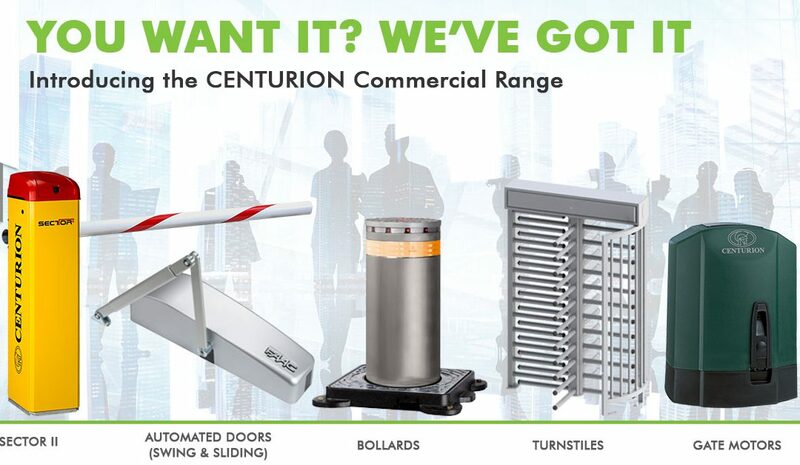 Following the company’s acquisition by multinational manufacturer FAAC in 2016, CENTURION has added substantively to its commercial product stable, which includes traffic barriers, door automation solutions, bollards, tyre killers and heavy-duty sliding gate motors. These systems, which incorporate cutting-edge technology and top-quality components sourced from the world’s leading suppliers, are effective in adding high-security to demanding sites such as office parks, shopping centres, hospitals and sports stadiums. With combined industry experience of more than 80 years, an unwavering commitment to producing products that set the standard in terms of reliability and functionality, and a true passion for making people’s lives easier, the CENTURION/FAAC partnership is delivering holistic solutions to security challenges in virtually any environment. CENTURION manufactures gate motors for both swing and sliding gates, with operators available for domestic, light-industrial and full industrial applications. The company’s best-known industrial gate operator, the D10 slider, boasts a die-cast aluminium gearbox for maximum efficiency and reliability, a powerful 24V electric motor and, most significantly, an intelligent LCD interface offering a host of selectable features as well as easy setup and advanced diagnostics. The success and popularity of the D10 led to a high-speed model being developed, and in 2012 the aptly-named D10 Turbo saw the light with a lightning-fast operating speed of 830mm/second. FAAC’s 400V behemoth, the 884MC 3PH, has been manufactured to handle the heaviest commercial and industrial-type gates in the simplest, most convenient way, and is capable of automation gates weighing up to a mind-blowing three and a half tonnes. CENTURION’s traffic barriers are designed to handle very heavy traffic, and can happily perform up to 3000 operations every single day, even during power failures. A beefy DC gearbox coupled with a tough-as-nails housing and intelligent and feature-rich controller make CENTURION barriers the automatic choice for access control points with lots of cars going in and out. Tyre killers and pedestrian barrier fences can also be added to create a fully comprehensive access control system. Need dependable access control for that particularly wide entrance or exit? When standard boom pole lengths just won’t do, the FAAC B680H traffic barrier has you covered. Customisable for roadways up to 8m and capable of delivering two million cycles of continuous use, this powerful barrier offers a reliable solution for even the most demanding of traffic control applications. The FAAC bollard range includes solutions for vehicle traffic control in residential, commercial, industrial and urban areas and boasts FAAC’s celebrated hydraulic technology as well as high-quality components ensuring exceptional performance and greatly simplified installation and maintenance. FAAC products embrace a pronounced flair for aesthetics, favouring sleek elegance not only in terms of design but also in terms of operation, opening and closing in absolute comfort, silence and style. The Italian brand’s door automation solutions are leading edge in terms of their looks, which is becoming a critical requirement in the design of access control equipment. Particularly with door automation, where the operators are more exposed to the user, the requirement is for something that is modern, sleek and befitting the style and construction of the building. One just has to look at FAAC’s ASD range to know that they satisfy this requirement. For more information on our award winning range of commercial products, please contact our friendly and professional Exports team here.